The timing of cleaning out gutters will prolong there life and help stop costly repairs from water damage. Gutters should be cleaned out once to twice a year depending on trees near the property and moss on the roof, at the start of Autumn and/or at the beginning of spring. its easier to clean out leafs at the end of autumn as the leafs will still be quite dry and easier to remove. Spring tends to be a bit trickier due to the leafs and moss being wetter due to the weather, having said that cleaning the gutters with the right tools really will help. 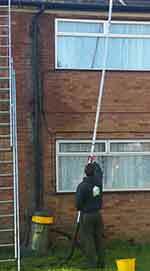 What we are the best homemade gutter cleaning tools are a decorating pole and a tennis ball complicated stuff we know! all you have to do is pierce a small whole in the bottom of the tennis ball and force it on to the end of the decorating pole its easy and works brilliantly. When cleaning downpipes 90% of blockages happen in the swan necks (the bends located at the top of the downpipe), you can cut off a bit of hose pipe 2 feet long and thrust it back and forth until it moves about freely, then grab a hose or bucket of water to run down the downipe to make sure the water is running freely and as it should. Cleaning out dust in the gutters can be a challenge in itself especially in dry conditions, if you have this problem there are 2 things to do a leaf blower is effective but if you don’t have one handy you can also wet the dust (not too much) then scoop it and it will come out effortlessly We hope this had helped out with any questions you might of had relating to gutter cleaning.